The most soothing tea you will ever drink. . .
A refreshing summer tea that calms anxiety, promotes restful sleep, helps with digestion, and even repels mosquitoes, Lemon Balm or Melissa officials is an important perennial to add to your beauty and medicine chest garden. Used by the ancient Greeks and Romans and found throughout most of Europe by the Middle Ages, lemon balm’s uses are extensive. Charles V of France drank lemon balm tea daily for his health; the Carmelite nuns sold Carmelite Water with lemon balm to cure nervous headaches; and a Swiss physician and alchemist Paracelsus (1493-1541) believed the plant was the “elixir of life.” This perennial herb is still prized for its many uses as an all around general tonic for the body. And it is no surprise, that lemon balm - filled with antioxidants - is delicious for the skin. Add a handful of crushed fresh or dried leaves to a muslin bag, and let the warm water run through it as you fill the bathtub. It also contains anti-viral properties so it lends itself as a topical application for treating cold sores. It doesn’t seem to prevent them but it does speed healing, so states Celeste Robb-Nicholson, editor in chief of Harvard Women’s Health Watch. Add a drop or two of lemon balm essential oil to aloe vera juice and you have a soothing and beneficial facial toner. Beware. It is one of the most expensive oils you can purchase. That means each drop is precious. The oil is steamed distilled from the flowering tops of the plant as well as the leaves. The reason the cost is so high is that yields are low. Only .5 ml of essential oil per kilo of lemon balm distilled. That’s a lot of plant material. But growing lemon balm is easy and inexpensive. It is in the mint family and so spreads and propagates with little effort. It can compete for garden space so plant it next to other vigorous perennials that will hold their own. The plant grows to be 2 feet tall or so and pruning a few times during the season will help to maintain new growth. Here in Hawaii, it grows year round. In very cold climates, mulch the plants and they will survive the winter. My favorite way to enjoy the benefits of this herb is to make a tisane or infusion with fresh cuttings. Chop the leaves and stems and pour boiling water over them. I use about three big handfuls for a 1/2 gallon jar. Let the herb steep for two hours or more and then chill and serve. 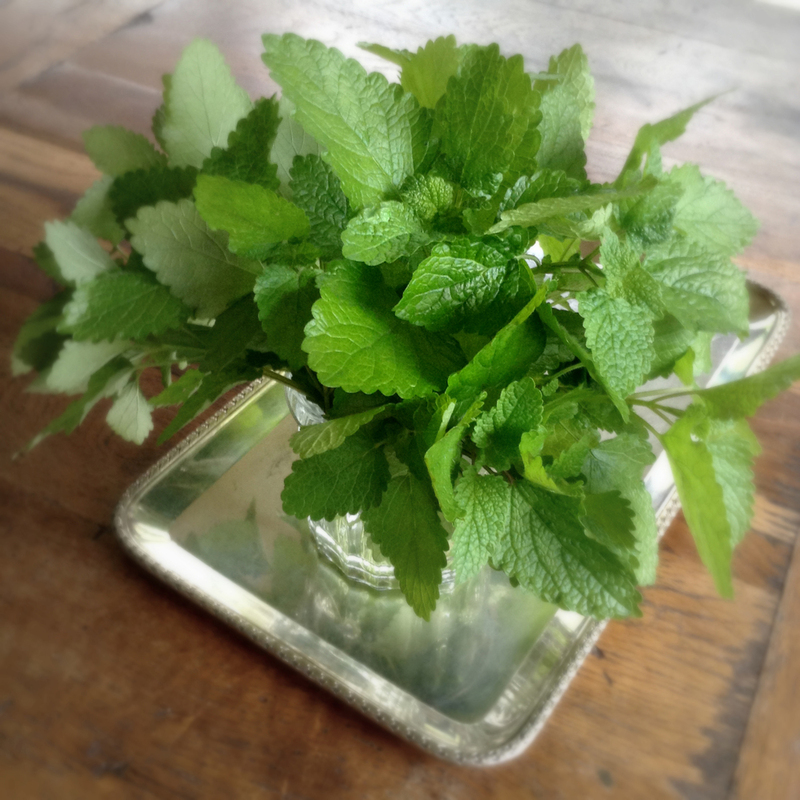 If you do not have fresh lemon balm, you can use 1 oz. of dried herb per quart of water and let it steep for four hours or more before straining and refrigerating. Keep your jar covered because you do not want the delicious oils that provide the herb its lemony scent to evaporate with the steam. My favorite drink when I’m visiting Austria is a type of Mojito minus the rum and made from lemon balm. Add lemon juice and honey or organic simple sugar syrup to fresh leaves and flowers, muddle together, and you have a sweet and fabulous beverage. Lemon balm is safe, delicious, and easy to grow. Reach for a cup of lemon balm tea the next time you have a headache or can’t sleep or just want something yummy to drink on a hot summer's day or a cold winter’s night. Your body will thank you. Enjoy.